After tailoring the results to my interests (using my previous queries, ratings, videos watched), there's a big change. 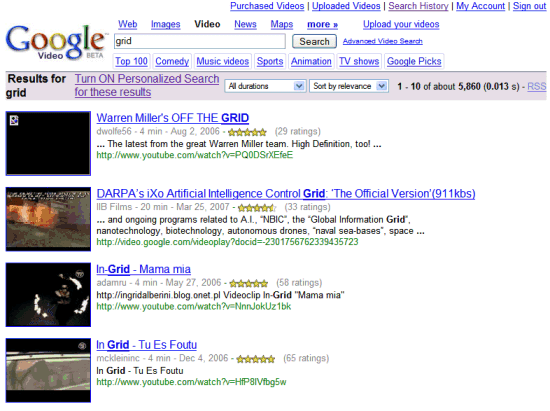 In-grid's music videos are no longer in the top results (the two videos were moved to #6 and #7). 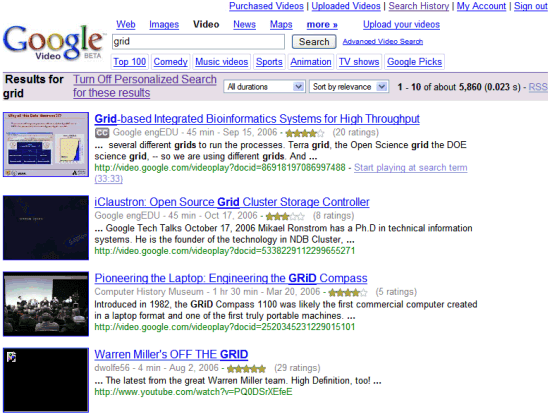 Meanwhile, the video "Grid-based Integrated Bioinformatics Systems for High Throughput" was moved from #7 to #1, "iClaustron: Open Source Grid Cluster Storage Controller" was moved from #11 to #2, "Pioneering the Laptop: Engineering the GRiD Compass" was moved from #29 to #3 and "Warren Miller's OFF THE GRID" (the only video from the top 5 that is not about computers) was downgraded from #1 to #4.